Sen. Rebecca Millett, D-Cape Elizabeth, at the statehouse in Augusta in this March 3, 2017, file photo. A paid sick leave proposal that could be a highlight for the new Democratic-controlled Legislature is advancing at the State House, but opposition remains among business groups and it’s unclear where Gov. Janet Mills stands so far. Republicans have already laid out a proposed list of changes meshing with interest groups including the Maine State Chamber of Commerce that are skeptical of Democrats’ current proposal. The minority party will press its case at a news conference on Tuesday. 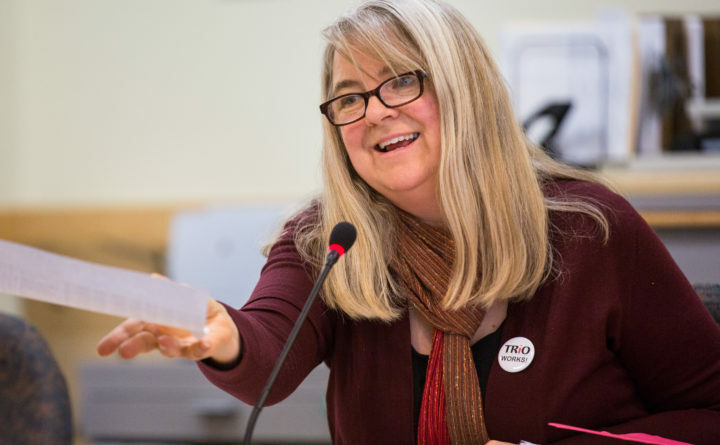 Democrats made changes to the bill during a stakeholder process, but business interests were disappointed and deemed them only ‘minor tweaks.’ The sick leave bill sponsored by Sen. Rebecca Millett, D-Cape Elizabeth — which could head off a referendum being floated for 2020 by the progressive Maine People’s Alliance — was endorsed by the Democratic majority of the Legislature’s labor committee last week. The bill hasn’t been sent to the full Legislature, so there’s still time for the panel to change it if it wants to. The original version would have provided a right to earned sick time for people employed by businesses with five or more employees. Now, the Democratic version shaped in part by a stakeholder group including business interests and the Maine People’s Alliance would specify that it only applies to businesses employing that many people for 13 weeks of the year. That was the major change during the stakeholder process, which Curtis Picard, the CEO of the Retail Association of Maine, said only led to “minor tweaks.” Peter Gore, a lobbyist for the Maine State Chamber of Commerce, said it led to no major concessions. Those groups have advocated for a 15-employee threshold that conforms to the one in the Family Medical Leave Act, pre-emption of local laws and other changes. At the five-employee threshold, about 91 percent of privately employed people in Maine would be covered, according to 2016 state data. Only 66 percent of employees work at firms with more than 20 workers. Millett said she thought business groups “wanted me to make changes completely in their direction” without acknowledging that there were other groups who “wanted me to make changes in the opposite direction” — like the universal program the referendum would produce. Republicans will lay out similar concerns on Tuesday, though they’re not in the driver’s seat. At their news conference on Tuesday, legislative Republicans will lay out their proposed sick leave bill, which would only apply businesses with 15 or more employees and include pre-emption of local laws, a slower accrual rate and the removal of a provision allowing a private right of action against businesses alleged to violate the new law. The legislative push for sick leave has seemed somewhat inevitable to pass, particularly when backstopped by the potential referendum. Maine passed a minimum wage increase at the ballot box in 2016 with many of the same players on both sides of the issue. “I can count as well as the next person. The votes are probably there to pass this,” Gore said. “It’s not a law that the small business community will have an easy time dealing with. However, Mills’ administration hasn’t taken a stance on it yet that could further shape the conversation. There is still time for Republicans to influence it, but that will be a matter of how much Democrats let them as they look to reap some of the first rewards from their new majority. Voters in parts of Bangor and Orono will elect their new state representative today. Former state Sen. Joe Perry, a Democrat, and Republican Thomas White are running to succeed Aaron Frey, who won a fourth term representing District 124 in November, but gave it up when legislators elected him to be attorney general. Polls are open until 8 p.m. Click here to read about the election, in which Democrats have voter registration and recent history on their side. — In the Marine Resources Committee, members will consider a pair of bills from Rep. Genevieve McDonald, D-Stonington: LD 1059, a bill to establish an apprentice license for Maine’s scallop fishery, and LD 174, to promote youth participation in the lobster fishery. Listen here. — The Committee on Health Coverage and Financial Services could vote whether to recommend a bill from Sen. Shenna Bellows, D-Manchester, LD 641, that would allow pharmacists to give anyone at risk of severe allergic reaction an Epinephrine Auto-injector, also known as an EpiPen, for free. Listen here. — Public hearings on two different bills — LD 198 from Rep. David McCrea, D-Fort Fairfield, and LD 526, from Rep. Stephen Stanley, D-Medway — that require horse-drawn or non-motorized carriages be outfitted with reflectors and lights will begin at 1 p.m. before the Transportation Committee. Listen here. — The Committee on Agriculture, Conservation and Forestry is scheduled to vote on a bill, LD 620, from Rep. Jan Dodge, D-Belfast, that would change Maine law by allowing the state to refuse or revoke a land-based aquaculture license if the aquaculture activity poses an “unreasonable risk” to marine or freshwater environments. Dodge’s community is the current chosen site for what would be the state’s largest salmon aquaculture farm that has split support among residents, who disagree about its negative environmental impacts. The committee will consider a separate bill, LD 515, from Rep. Bill Pluecker, I-Warren, that would require certain restaurants or commercial food retailers to publicly display ingredient lists. Listen to the meeting here. — The leaders of the biggest union at one of Maine’s largest employers are fighting among themselves. Mike Keenan, president of Local S6 of the machinists union at Bath Iron Works, on Thursday filed “trial board charges” with the union alleging misconduct by the local’s secretary-treasurer and chief steward. But those officers deny wrongdoing and say Keenan is retaliating against executive board members who have tried unsuccessfully for two years to work with him. The union squabbles come as the shipyard is preparing to hire hundreds of workers to complete Navy contracts and as the union gets ready to begin negotiations on a new contract. The executive board of the local, which represents about 3,500 shipyard workers, recently asked national union officials to oversee local operations. — Maine has a shiny new courthouse. The Waldo Judicial Center opened Friday in downtown Belfast. It replaces Waldo County Superior Court, which has been around since the first half of the 19th century, and Belfast District Court. Its construction results from a 2016 law that authorized spending up to $95.6 million on projects in Oxford, Waldo and York counties, of which the Belfast project — which past reports said would cost an estimated $17 million — is the first to be completed. — The president’s budget needs a lot of work, according to the two most senior members of Maine’s congressional delegation. Maine Public reports that Republican U.S. Sen. Susan Collins and Democratic U.S. Rep. Chellie Pingree both panned the $4.7 trillion spending proposal that President Donald Trump unveiled Monday. Collins expressed concern that Trump’s plan would blow through federal spending caps put in place as part of the Budget Control Act of 2011. Pingree said many elements of Trump’s proposal have no chance of passing in the House, where Democrats hold a majority. The great black hawk that flew all the way from Central America to Maine and was rescued during a blizzard — only to die after contracting a severe case of frostbite — has a final resting place. Its remains will be displayed at the Maine State Museum, where it will join the labor mural, tourmaline, old mill parts and other items that once captured the hearts, minds and attention of Maine people. It seems like a fitting resting place, and I hope that the exhibit includes an audio component that plays banjournalist Troy R. Bennett’s musical ode to the bird on repeat. But simply relegating the feathered remains to a perch in the museum seems like a missed opportunity. As lawmakers on the State and Local Government Committee and people with nothing better to do got ruffled and chippy about calls to change the state bird and state flag, the hawk offered a rare chance for an all-purpose solution. Designate the hawk to be Maine’s state bird — it definitely would have outmuscled any kind of chickadee for the title — and put it on the state flag. That trifecta would have Maine’s shiny object crowd aglow like a murder of crows in a feldspar mine.